Yep, Paige Deckert is back! In between human psych experiments, she took the time to write this review. If you look very carefully at the picture below, then go to her Twitter account linked above, you might see some similarities! Could be another experiment, and we are the rats, not sure. A large part of the beer community is just that--community. As a result, collaboration among breweries is not only inevitable, but encouraged. Both of the breweries in this collaboration hold a special place in my heart. As mentioned in my previous review, Three Floyds is the brewery that really got me into craft beer; despite being in Indiana, to me it represents where I grew up, my college years, and my "home friends." Before moving to Pennsylvania, I had never tasted anything by Dogfish Head. Enter my [now] roommate Sari; we both became so enamored that we ended up roadtripping down to Milton and Rehoboth Beach with another friend (see photo below). 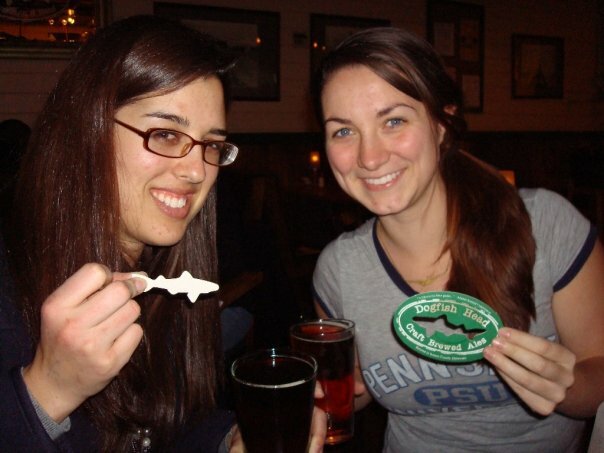 Despite that Delaware isn't Pennsylvania, Dogfish Head for me represents my current life, grad school, and my "PA friends." So in a way, this beer kind of bridges my two "lives." Poppa Skull is the second collaboration brew between Three Floyds and Dogfish Head, this one brewed in Milton, Delaware. The first, Popskull, was brewed at Three Floyds and is a high-gravity lager aged on Palo Santo wood chunks. 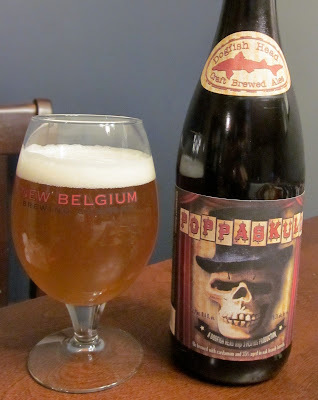 Poppa Skull rolls in with an ABV of 10% and 20 IBUs, with 1/3 aged in oak brandy barrels for 6 months. I picked up this beer from the Three Floyds Brewpub in Munster, Indiana. I poured the 750ml bottle into two pretty New Belgium glasses (I’m a nice roommate, and share). The nose consists primarily of cardamom, and the Belgian yeast. The mouthfeel is pretty light, primarily a by-product of the high carb. The carbonation actually makes it quite hard to really taste the beer for the first second or so it’s in your mouth. Next, there’s a little funk from the yeast, the cardamom, but then it dissipates pretty quickly. There’s no lacing staying on the glasses, and it tastes much sweeter than it smells. The oak-brandy flavors aren’t prominent—probably something you wouldn’t find if you didn’t already know it’s there. It hides the alcohol in the taste, tasting more like 6-7% to me, rather than 10%. As it is gets warmer, the cardamom becomes more pronounced and the beer begins to feel more mouth heavy; we both think we would like it more if you could taste the yeast more later on. It’s very interesting and unique, which I appreciate. I’m not sure, however, if I could drink much more than the glass that I have. That is what sharing is for though, right? Despite flavors that we would consider “Christmasy” (the cardamom and brandy,) it seems to fit moreso as an early spring beer because of the yeast, carbonation, and lightness on the tongue. If I were drinking it in the winter, I would want more body from it. The flavor is good, but as Sari said, “what there is of it,” describing the lack of flavors in the beginning; however, they did become somewhat overpowering later on. Foodwise it seems kind of hard to pair because of the uniqueness of the flavors. We think it would go with some sort of salty salad (niscioise or greek), or a fresh fruit tart with a nice buttery crust… preferably eaten out on the back porch. Overall, it’s a good beer, but not something either of us would necessarily seek out.